Tam Coc - Bich Dong is considered the most appealing tourist attraction in Ninh Binh, known for famous names such as "South second nicest grotto". Tam Coc (Three Grotto) includes Hang Ca, Hang Hai and Hang Ba Grottoes. All of 3 caves are formed by Ngo Dong River crashing through mountains... Far about 100km from Hanoi city center along Highway 1A, tourists will meet Tam Coc - Bich Dong, the most famous landscape of Ninh Binh travel. Tourists to Tam Coc - Bich Dong will actually feel the charming beauty of the waters and mountains. 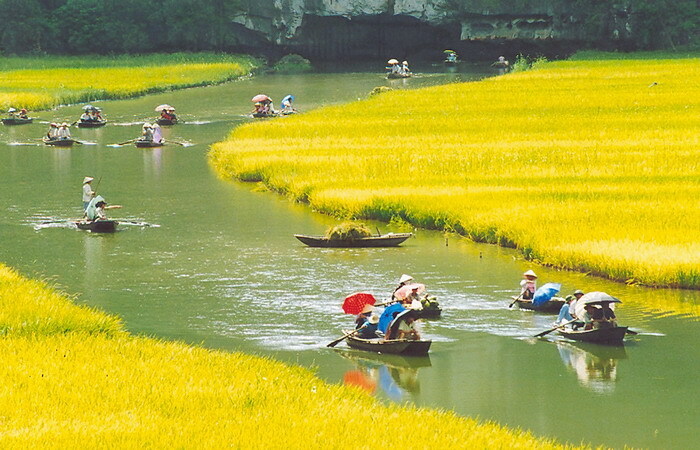 Ninh Binh today retains numerous scenic spots, yet Tam Coc - Bich Dong is the oldest one and the only region where the local people still cultivate the wet rice combining with tourism development. 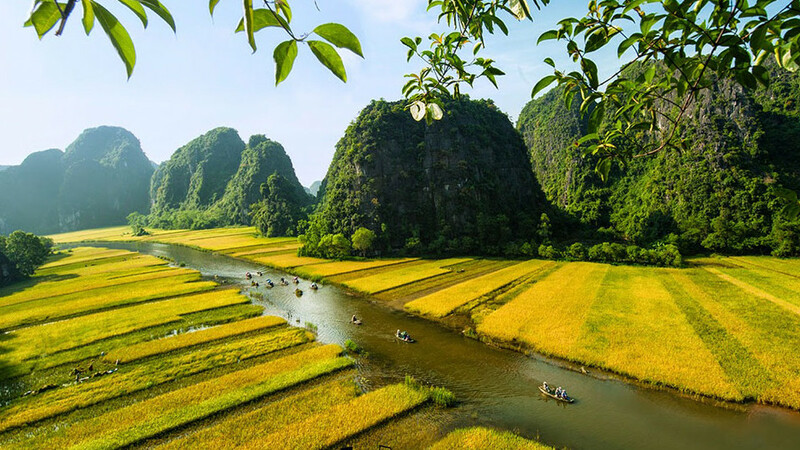 Located in Ninh Hai commune, Hoa Lu district, Ninh Binh province, Tam Coc - Bich Dong is a harmonious architectural ensemble, a scenic spot which is considered as “a terrestrial Halong Bay" thanks to endlessly stretching mountain views, stunning caves, and charming waterways. The journey to discover Tam Coc departs from Dinh Cac Wharf along winding Ngo Dong River with the ripe rice field’s surrounding. Tourists comfortably admire the panoramic views of the amazing limestones, carefully observe exotic aquatic species in the waters or contemplate the flocks of white flamingo on the lawns in the lagoon. Along Ngo Dong River, tourists will respectively set foot in 3 caves through the mountains, namely Hang Ca, Hang Hai, and Hang Ba Grottoes. Hang Ca Grotto owns 127m long crashing through a large mountain, with its entrance gate of 20 meters wide. Meanwhile, just nearby, Hang Ba is about 50m long and its ceiling is lower than the above two. It looks like a plutonic cupola. It will take about 2-3 hours for tourists to completely admire all 3 grottoes and take the beautiful photos of Tam Coc. However, it is also the precious moments to relax, comfort, and immerse their minds in nature and poetic scenery. Tam Coc - Bich Dong is an indispensable rendezvous in any Ninh Binh tours. In particular, in the journey to discover Tam Coc, tourists should not miss Bich Dong Pagoda. Far about 2 km from Tam Coc Wharf, Bich Dong Pagoda associates with limestones inspired Oriental architectural style. According to the history and epigraphies, the former name of the pagoda and grottoes is Bich Son (Green Grotto or Pearl Grotto). Thanks to the magnificent scenery, the grottoes have dubbed "South second nicest grottoes". Whole pagoda was built under the layout of "Tam Toa" style. Ha (Lower) Pagoda is situated in the foothills which is prominent in the architectural characteristics strongly inspired by Oriental style: the trusses, crossbeams, and spars were made from ironwood. The roof of the pagoda includes 2 curved storeys and 8-roofs. Up to about 120 other blue stone steps, tourists will meet Trung (Middle) Pagoda, a unique pagoda which its half is opencast and the other is attached the cave. Continue climbing 40 stone steps is Thuong (Upper) Pagoda in the highest position, worshiping Guan Yin Buddha Ba. The both sides of the main pagoda are 2 temples worshiping the God Earth on the right and Saint Son Tran on the left. Standing on the campus of Thuong Pagoda, tourists completely admire Ngu Mon field and cover the panoramic view of Bich Dong Pagoda. Not only owning the graceful beauty of the charming landscape, the cultural-art architecture, Tam Coc - Bich Dong is a historical relic of Ninh Binh. It can be said that the wonderful landscapes is the harmonious combination between exotic beauty of the cave, the rugged mountains, the romantic waters and the brilliance of the humans forming an inseparable unity. In particular, the Trang An - Tam Coc - Bich Dong scenic complex has been ranked as special national monument thanks to its precious values on history, culture, science and aesthetics. Not only as a famous tourist complex, Tam Coc - Bich Dong is also one of 20 crucial tourism destinations of Vietnam which the government has invested in the construction and upgraded infrastructure. Tam Coc - Bich Dong has been a green - clean - beautiful tourist complex, a safe rendezvous for all tourists, contributing to promote Ninh Binh tourismto domestic and international tourists.